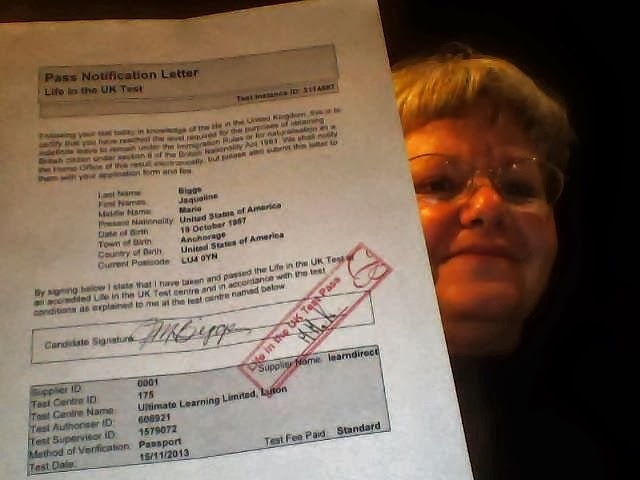 After Six months of studying the "Life in the UK" Handbook I took my exam this morning. The test centre gives one 45 minutes to complete the 25 questions. It took me six minutes and I missed one question: Which court deals with Civil complaints? a. County Court b. Magistrates Court c. Crown Court d. High Court. I thought it was a. but I chose b. This was a pass/fail exam but I remember my questions--especially the two I felt stuck on. So I looked up the answers in the handbook when I arrived back home. I feel like a five hundred pound gorilla has been lifted off my back. It is such a relief to have that daily background anxiety gone. Now I can focus more fully on taking care of Les. On Tuesday the 26th we have an appointment with the Settlement Checking Office in Hertfordshire to review my application and documents for Leave To Remain (of which the pass certification letter is one), pay the £1059 application fee and submit everything to the UK Border Agency, and try not to become anxious all over again as we wait for an answer. A very special thank-you to Tom on NB Waiouru for advice on the exam, for suggesting we use the Settlement Checking Service, and for vetting my personal statement. Your support and encouragement based on your actual experience with the same have meant the world during this stressful time. Thanks also to Ken and Sue Deveson-NB Cleddau, and the two Mikes from Cow Roast--NB Albion Mills and NB Independence, for moral support and encouragement. A special big hug to my lovely daughter in law Joanne Biggs for taking me today, and for a celebratory Costa Latte after! Two completely different days: Monday was raining hard as the fuel boat Towcester came alongside. Jules and Richard run the service under the name of Jules Fuels. 07740487222. On this section of their run (Stoke Bruerne to Hemel Hempstead) they pass through every four weeks. Not sure about the northern route but I believe it is up to at least Braunston and perhaps further. We appreciate the opportunity to give our custom to working boats. We also appreciate that Jules and Richard's diesel comes with a bio fuel additive already in it that fights diesel bug. We have also been extremely satisfied with the good quality coal they sell. Today being warm and dry, Jaq decided to let the fire go out and clean the chimney. You have read of my admiration of Jaq`s ability to move the boat for water. Now I must add "chimney sweep" to the list. All I did, actually it was all I could do, was stand by and give directions. Afterwards Jaq said it was a very satisfying job, seeing the amount of soot that ended up on the floor of the stove after the chimney was scrubbed. All I can say to my fellow male boaters is--can your partner take over the boat if you find yourself incapacitated? I am so glad Jaq was so quick to take control of NB Valerie three days after arriving in the U. K. and has in the last two years, gone from strength to strength. On the health front appointments have come through for a follow up exam with the surgeon and a first time appointment with the Urology dept. 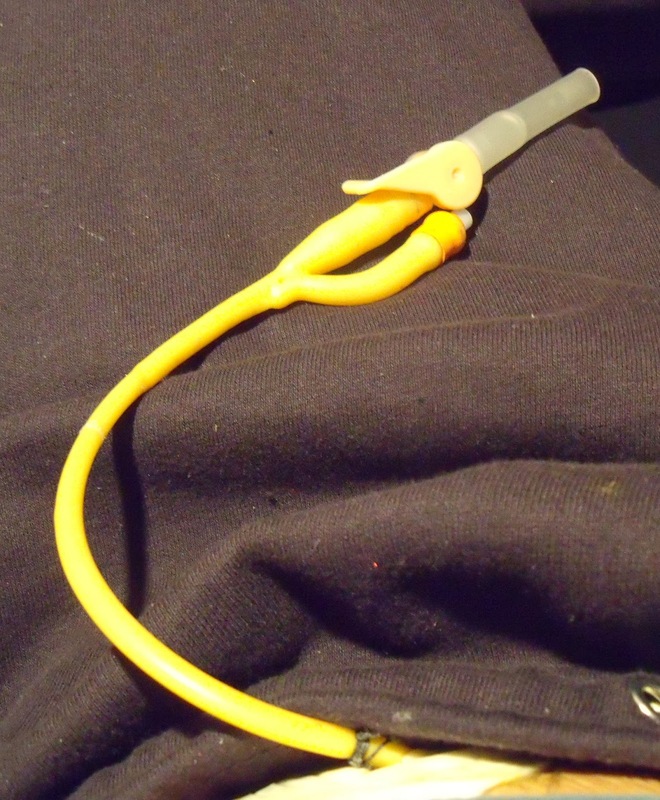 The latter is to test the flow through the urethra with a view to removing the catheter. This would still leave the small op to correct the urethra problems. These appointments are at the end of this month. In the meantime the surgery wound is healing well although the catheter is a nuisance hanging inside my pants especially since I can still pee normally, but it might be out soon. As for the stoma, I need to live with it for a few months and then surgery will be scheduled to reverse the procedure. I find the stoma easy to maintain but question the advice to empty the pouch several times a day but only put on a fresh pouch every two days or so. I am going to use a fresh one daily. As soon as I am up every morning (7 am) I don't dare lounge in my jammies. I get cleaned up in the bathroom and get dressed because as soon as he gets up his stoma and urine bag, etc. will take center place in the loo for awhile and its best if I am cleaned up and out of the way especially since the loo is only a tiny room 4ft by 4 ft. While he is emptying and cleaning up, I make his bed, make my bed (I am sleeping on the fold out dinette bed because otherwise our bed would have to be pulled out into its full 6 ft and 6 ft mode to accommodate us both and either he would have to crawl over me or vice versa in order to use the loo in the night), rake out the wood stove, bring in more coal and wood, revive the fire, and by now he is sitting at the dinette feeling "peckish" and wanting breakfast. I start him on his medication rounds, juice oranges for us, fix his organic oatmeal, do the breakfast dishes, clean the juicer, and finally sit down for a badly needed cup of coffee. Les eats, dresses, and collapses in his recliner. I am already thinking about laundry, moving the boat for water, what to fix for lunch, when to make the next batch of juice, making sure the boat is tidy and organized when the visiting nurse comes to call, working online, etc. etc. etc. It really is good to "just chill and relax though, doing nothing!!" It really is a good thing I love him dearly!!! And really good I am a woman because I don't think most men could deal with "six impossible things at once before breakfast," as Lewis Carroll's Alice commented in Through the Looking Glass. Seriously though it is grand to have my baby back home. Each day is a new experience for Les as he has never been seriously ill before now. He was the patient his doctor called "The man who never needs to see me." This has all been extremely difficult for an active, healthy man used to being up and about his business each day without giving any of it a thought. Now he has to think about how to get from the bed to the bathroom; the mechanics of getting dressed and keeping warm. Now Les knows what I mean when I say, "I feel like I've been reincarnated as a limp dish rag." Old decor: IKEA chairs, upholstery etc. Before Les went off to hospital we purchased new chairs for the saloon. It's funny how our minds travel in the same direction at the same time...each of us was searching on our respective computers for something suitable with which to replace our uncomfortable IKEA Poang chairs. Neither of us said a word about it to the other! Les was never really comfortable in those chairs so we knew he would feel even worse after abdominal surgery. I also figured he would have a terrible time rising out of the chair on his own since one's bum sits lower than one's knees. 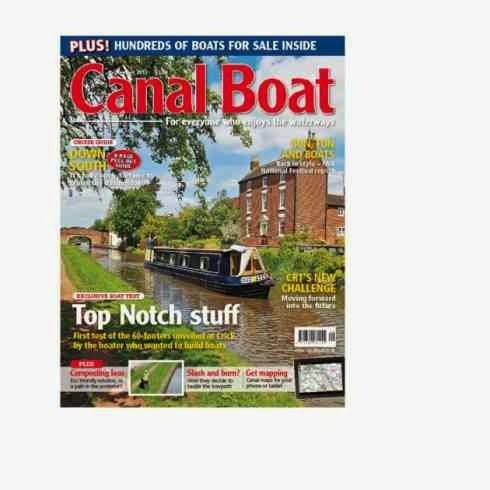 Les went to his stalwart favorite source for all things boaty--Canal World Forum where a chap mentioned he found brilliant recliners for just under £100 at B & M which fit in his narrow boat! After chasing down a B & M store fairly near us in Bletchley, son Kevin took us to view them. Les measured them--and the recliners were narrower than the IKEA chairs. Sold!! It was an easy bit of work for a brawny lad like Kev to help Les bring the chairs inside. They came in two pieces which fit through the door sideways and slotted together perfectly. Viola!! For the first time in my life as a short shanked person, I have a reclining chair that fits me. I don't feel like Lilly Tomlin's character Edith Ann sitting in daddy's over-sized chair!! Les can easily stretch out and unfold his surgical area, falling asleep easily in his chair. He is comfortable and finds it easy to sit and rise. was replacing our dinette cushions. Worn with six years of use, the thin, cheap foam was disintegrating at the corners and the cheap, thin material had completely worn through in places--threadbare and sad. I knew one of us would be sleeping on the dinette bed and neither of us was going to find comfort or rest on the old upholstery. Again Les found the answer--the shop in Watford where he purchased the large chunk of foam to make our bed extension back in 2011. 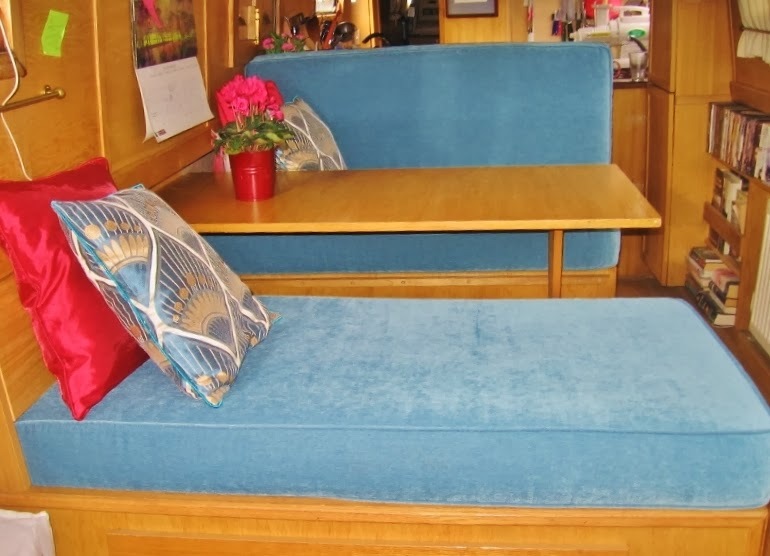 A trip to The Upholstery Workshop with daughter in law Bev allowed us to choose solid, high quality five inch thick foam for the cushions and a hard wearing, easy washing material for the covers. I chose Teal which accented the new red tiles Les installed around our hearth last summer. 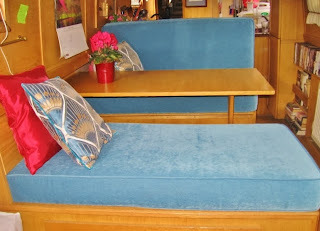 The shop owner was very accommodating in our need for speed due to Les' impending surgery--while he was quite busy, the chap pushed our order through in three weeks time and the new cushions came home to NB Valerie just shy of a week before Les came home too. We paid £348.00 for the three new cushions with covers which we thought was a great deal. The work is very high quality and we recommend this shop without reservation. Of course new cushions meant a re-do of some of the other bits of our interior design, so I replaced our throw pillows with new ones in red, and teal with a touch of light wheat to pull in the wheat colored curtains on the windows. 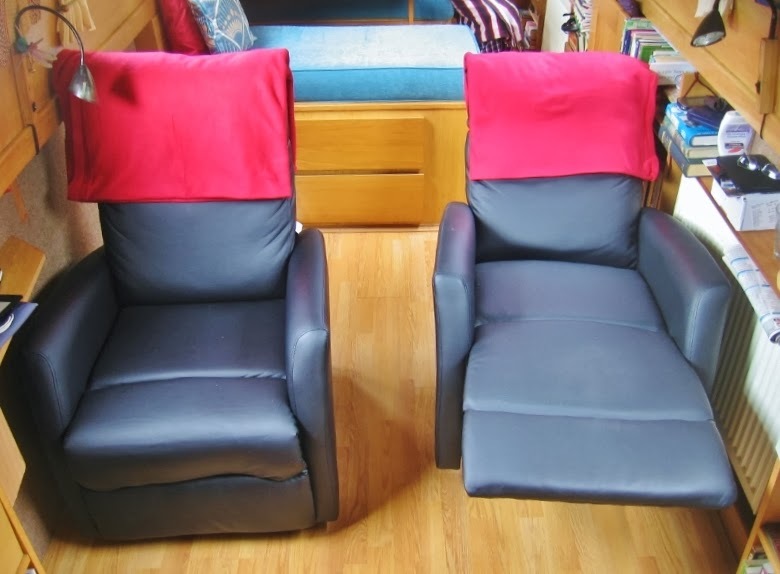 I replaced our blanket wraps which hung over the backs of our old chairs, with soft red fleecy blankets to tuck around us while we lounge in our new recliners, enjoying the warmth of the fire. Sue, Ken and my favorite boater! Les' first days home were punctuated by a welcome visit from friends Ken and Sue Deveson. It cheered us no end to see them both, and we had a good natter over cups of coffee. Sue took me to Tesco's for a grocery top up while Ken and Les poured over some lovely canal related books Ken and Sue thoughtfully brought for Les to borrow and read. They also brought me a plant--a cyclamen the exact scarlet color of our new decor! We will hold them both in our thoughts as late November comes on and the Devesons fly to the States to enjoy Thanksgiving on the 28th with their son, daughter in law and grandchildren--the Cali Crew (California). 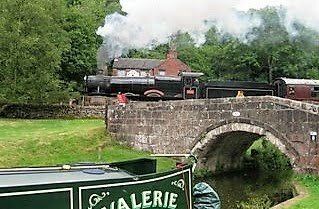 Meanwhile on NB Valerie, we give thanks for Les' recovery and each other; for old friends and new along the canals and across the world; for the love of family here and in the States, and for the comfort and love we share with one another. The first picture has to have some boat theme because of late this blog seems to have changed to a medical blog although, judging by communications from readers a lot of folk are interested in this side of our present life. This picture shows our current mooring--home for the last three and a half weeks. Canal and River Trust are fully aware of our situation and although we get logged on the system our overstay is acceptable. Obviously they can look at their sightings log and see our previous cruising has taken us all over the canal system, which recognizes us as genuine Continuous Cruisers. We have the one mooring space that lies between the edge of the winding (turning) hole and the bridge that spans the marina entrance. 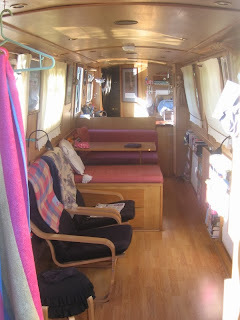 To the side of the boat we have a width of grass that enables Jaq to put up a washing line on favourable days, Monday was both sunny and breezy; Jaq caught up on the backlog of laundry caused by her travelling back and forth to the hospital. Just behind the camera is a lock, and a lane offering parking for visitors with access to the main road for Jaq to use a bus although mostly she has been given lifts by family and boaters on long term CaRT moorings opposite. Many thanks to the two Mikes (NB Albion Mills and NB Independence). Your help is much appreciated. Also to the lady who called across offering help to Jaq yesterday as she set off to reverse back to our mooring spot from the water point. I soon realised why Jaq thanked her but declined help, as I stood inside the boat looking out--and watching in awe as Jaq took us to and from the water point. Her words after were "oh I just had a good teacher." My answer is "no darling I am fortunate to have the best pupil in the world." In the last post I mentioned the boat resembling a small pharmacy and you can see what I mean in the picture below right, that shows just some of the items. To re-cap: the original admission was for removal of a cancerous tumour from the lower bowel and a temporary stoma (loop ileostomy) to allow the bowel to mend. I have a few pictures of my abdomen and the stoma but think some might prefer not to see them and others that do can have a Google. The stoma to me represents a new born baby that continually needs nappy changes and cleansing around what seems to be a never ending exit for waste products. Jaq calls it my "mini me" since it gurgles and chugs. Complications set in during the surgery when they tried to fit a catheter into my urethra--it wouldn't go. The surgeon called in a Urologist (who just happened to be finishing up a surgery in the theatre next door) who inserted a subcubital catheter directly into my bladder through the lower abdomen. I now have to return in the future for a small surgery to correct a narrowing and twist in the urethra. Meantime I now have two ways of emptying my bladder. Are you thinking if the natural way works why the catheter? When the Urologist came to see me I was having other problems and my attention was not 100% so the answer was not absorbed into my brain. I think it was because the natural exit for the bladder might stop working. Anyway this is the reason for perhaps 70% of the goods pictured. The catheter has a tap and I`m told to use both systems when using the bathroom. Now this works fine and as you can imagine when in the future I am out and about a visit to the loo is easy enough. A large supply of night bags are in the supplies but these are advised to be used at night in case the normal body alarm fails to wake me. The bag just connects to the tap and the bag hangs below the bed; in my case on the drawer front. 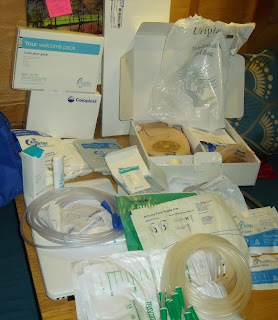 There are some other things I won`t need and I have just handed them to the nurses that come daily to change my incision dressing so they can be used by others. The problem is everything is ordered at the hospital but my subsequent orders will be made by me and will be just for what I need. These companies that have their foot in the hospital door take over your supplies by collecting prescriptions. 75% of stoma nurses are sponsored and although general prescription charges are down stoma costs have rocketed. The complimentary gifts you choose with your order are costing the NHS a fortune. Things like individual wet wipes, disposal bags for stoma pouches, miniature water spray bottles, squares of lint for drying around stoma. Oh and a fancy bag to store everything with the promise of a travel wallet, to carry enough for a day or two away, to arrive with my next order. These so called complimentary gifts are just stuff you can get in the supermarket at a fraction of what the NHS is charged. Some links Here and Here. I have had a needle phobia my entire life and have at times, had to have my arm held down when a needle comes near, in case I throw my arm away from the needle. Now during this two week stay in hospital I have had so many catheters put in and then moved, had daily blood taken from a new vein each time the fear has slightly worn off. 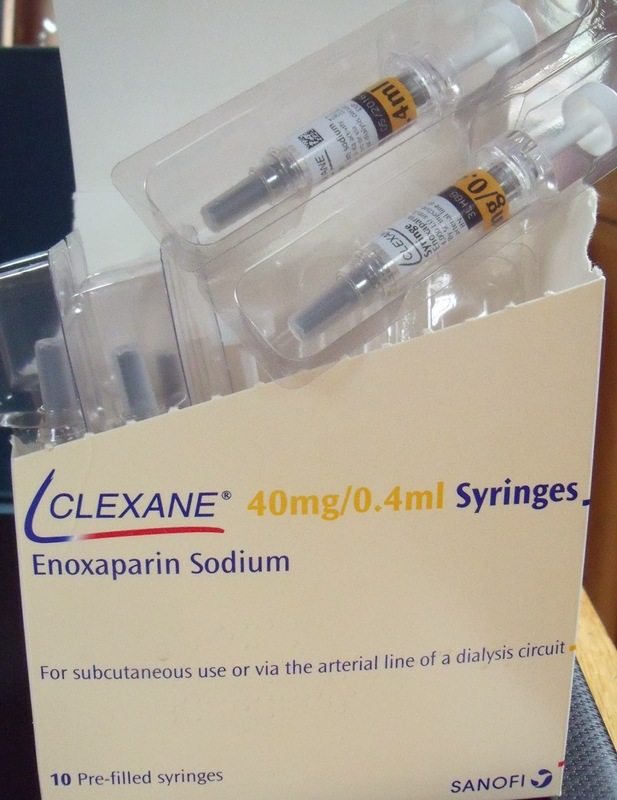 Clexane was prescribed for me daily as an anti blood clotting injection for about 28 days post op. 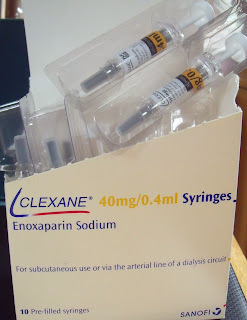 Hearing that this will probably go on longer than the daily visits by community nurses changing the surgical wound dressing, I decided while in hospital to try and inject myself. My reasoning is to skip wasting the visiting nurses' time which might be used by someone more in need. Pinching a fold of skin between thumb and index finger, in the needle went and down came the plunger. I still don`t know how I do it but such was my fear that each time I take an invisible bow to a non existent audience. Just about 10 more to go. A lot of things came back with me to the boat but one thing that didn`t make it was Mr. C. He quite literally got cut out of the coming home deal. 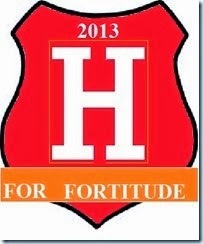 I am still very weak but at least now I can sleep for long periods at night and also doze in the chair during the day. 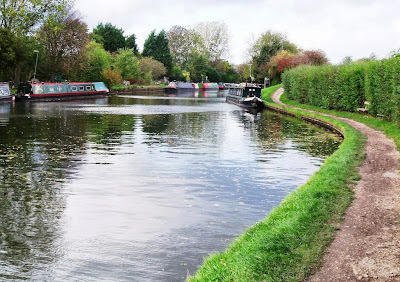 Moored in the heart of Lymm village on the Bridgewater canal. That`s it folks. I`m going to watch Man U on TV tonight. This view of the ground taken as we entered Manchester, again on the Bridgewater. Hello everyone. 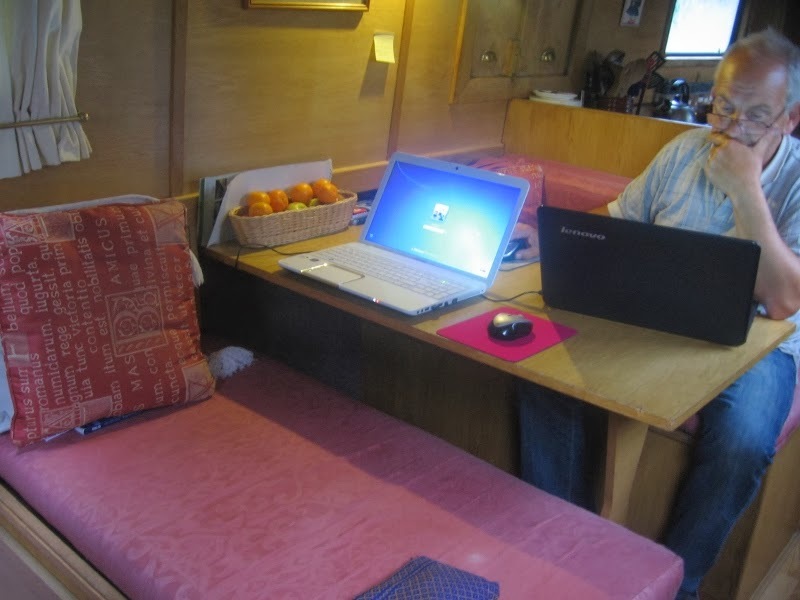 It feels god to be sitting at the dinette here on the boat with the Laptop in front of me. Those of you who have had major surgery will be aware of the post operative feeling of tiredness and weakness. Myself never having been in this situation find myself totally amazed just how weak I am. Having a shower wipes me out for at least 30 minutes. Catching up on sleep has been top priority and sleeping six hours the first night in a very dark, quiet environment aboard made a big difference. This sleep pattern has carried on with extra daytime two hour naps common. The second thing to catch up on is the loss of weight following nine days without solids. Initially I just had tiny amounts but the last two days have seen my intake increase quite a lot. Strangely in the past a Yoghurt was very much a no no on my daily diet and in fact had never tried one always having expected them to be something that was going off and having a vile taste. Now Jaq has me hooked on them with Blueberry being my favourite. The boat resembles a small pharmacy where apart from the usual pain meds associated with a hospital discharge I also have Urology and Colo-rectal supplies, lots of fresh dressings for the daily visits by the area nursing staff plus some self injected meds but more on that another blog post. Since being back on board I`m hearing more and more of the wonderful kindness shown by so many of you and hopefully Jaq has either privately or via the blog thanked you and I back those thanks a thousand fold. Just one I will mention is the lovely boater who I`m sure wishes to remain anonymous. The day I came home this lovely lady returned some bedding she had taken away to launder and dry. Again today she returned with some lovely vegetables from her allotment. Jaq and I are so grateful to you. Ok just typing this has worn me out and I need to stop.